As many other industries, digital marketing keeps improving on gender diversity. Not least thanks to the companies like Moz, that are really working on supporting women and giving them the chance to speak at the leading industry events. However, there’s still a lot of work to do. No need to go far to confirm that this problem of unequal gender representation is real: here’s a list of the best SEO experts to follow that was delivered by me, Purna Virji, Jenny Halasz, Loren Baker, and Danny Goodwin. Even though it was developed mainly by women, it features only a few female marketers. Today is March 8, the International Women’s Day, and this tribute serves to celebrate all the amazing women that we have in our industry. If you wonder how we pulled together the current list of female marketers, here’s where we gathered the data. The data is stunning: it seems like half of the industry contributed, which is absolutely amazing and makes my heart melt! Later on, I created a Twitter list that I want to update regularly. 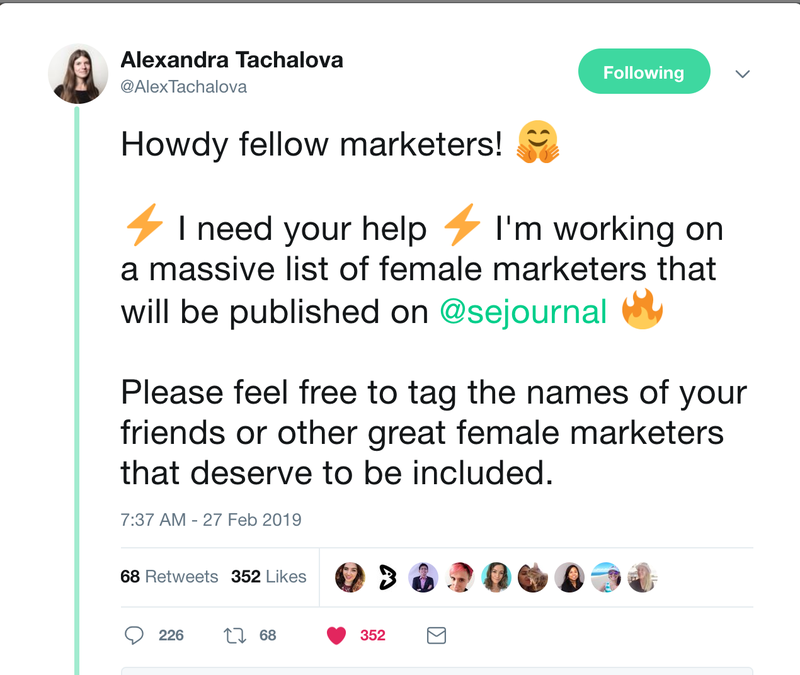 Then, I launched a survey, the main goal of which was to collect some interesting facts about female marketers who are featured in this post. Julie F Bacchini is the Founder & the President of Neptune Moon LLC. Listed by PPC Hero among the top 25 Most Influential PPC Experts. She’s a frequent speaker – SMX & Hero Conf speaker. #ppcchat Organizer. Rebekah Radice is a social media speaker, consultant, and trainer from Los Angeles, CA. She was named the top online and social media marketer by such well-known companies as SocialMediaExaminer, Brand24, and Onalytica. She’s also the author of “Social Media Mastery: A Comprehensive Guide to Strategic Growth” that will help make the most out of your social media channels. Sue B. Zimmerman, aka #InstagramGal, teaches entrepreneurs, business execs, and marketing professionals how to promote their business effectively on Instagram. She has been speaking at the largest social media conferences including Social Media Marketing World, Social Media Camp, ONTRApalooza, Social Media Day San Diego, and many others. Melanie Perkins if the co-founder and CEO of Canva, a graphic-design tool website. Before launching Canva, Melanie founded her first company, Fusion Books, an online design system for schools to create their yearbooks. Fusion Books is now the largest yearbook publisher in Australia and recently expanded to France and New Zealand. Kirsty Hulse is the founder of Manyminds, a digital agency made up exclusively of remote, freelance resource. She is a creativity trainer, desperate to help brands be more innovative, and have more fun, with their marketing. The author of Amazon #1 Bestseller “The Future is Freelance” and an evangelist of remote working. Kirsty is running a workshop at the next BrightonSEO for people who want to discover their voice and speak at conferences. Veronica Romney is a marketing and branding advocate and the co-founder of LoSoMo, a Florida-based online marketing, web development and personal branding agency. As the daughter of two Cuban immigrants who lived the American Dream, she is fiercely proud of her heritage and constantly driven by her parents’ entrepreneurial spirits. Val is an Email Marketing Strategist and Conversion Copywriter. She is obsessed with email marketing and customer experience. Also, she’s contributing regularly to the leading digital marketing blogs and speaking at the events that you all heard of. Joanne is an entrepreneur and the founder of Copy Hackers. Apart from contributing to the leading industry blogs, she was featured as a speaker at conferences like Mozcon, INBOUND, SearchLove and CXL Live. Britney Muller is the Senior SEO Scientist at Moz, public speaker, data-driven marketing advocate and the founder of Pryde Marketing. Pam Moore is the CEO and founder of Marketing Nutz, a full service social media, branding and digital marketing training and consulting agency. She was ranked by Forbes among the Top 10 Social Media Power Influencers, Top 10 Digital Marketers to Follow on Twitter, Top 10 most retweeted by digital marketers. The list only goes on. Now a Facebook Ads Consultant, Susan Wenograd has spent over 10 years in both client-side and agency-side roles working for brands such as General Motors, CircuitCity.com, and many others. Her initial roles in digital were in the copywriting and email marketing space, giving her unique perspective on the digital marketing life cycle, and the role of PPC within it. Susan is a frequent speaker at conferences around the country, including Pubcon, State of Search, SMX, and Digital Summit. Annie Cushing is a blogger and an independent data analyst. According to Annie, she has played just about every role one can play when it comes to creating and promoting content online. She runs a successful blog and regularly contributes to the industry leading publications. Pam Didner is a Tech Marketing Consultant, prominent speaker and author, and according to herself, a B2B marketer with sales mentality. Right now, she’s specializing in sales and marketing alignment. She has been a repeat presenter at some leading marketing events including Social Media Examiner, Social Media Marketing World, and Content Marketing World. Dana DiTomaso is President & Partner at Kick Point, where she applies marketing into strategies to grow clients’ businesses. In her spare time, Dana is the past-president of the Advertising Club of Edmonton and is the weekly technology columnist on CBC Edmonton AM. She also enjoys drinking fancy beer and yelling at football players. Michelle Robbins, former SVP Content & Marketing Technology, oversaw editorial direction as Editor in Chief for Third Door Media’s digital publications, Marketing Land, Search Engine Land and MarTech Today, directing a full-time staff of reporters and editors managing contributed content. An experienced domestic and international keynote and featured speaker, she enjoys connecting with the community at SMX, MarTech and other industry events. Ann Handley is a Wall Street Journal best-selling author, keynote speaker, and world’s first Chief Content Officer. She is a monthly columnist for Entrepreneur magazine, a member of the LinkedIn Influencer program , and the co-author of the best-selling book on content marketing. She currently has more than 260,000 followers on Twitter and writes about content, marketing and life at the highly entertaining AnnHandley.com. Carolyn Shelby specializes in technical and enterprise SEO, and has been helping corporations adjust their structure and focus to make the most of new media. As Director of Search Engine Optimization at tronc, Inc. (formerly Tribune Publishing), Carolyn and her team are responsible for technical SEO and organic audience-generation strategies. Her team delivers data-driven strategies through a commitment to web-analytics, employee training, and honest reporting. Lisa Myers is the founder and CEO of Verve Search, Women in Search, SEO-Chicks.com and co-founder of StateofSearch.com. Lisa also speaks frequently at conferences in the search and general digital marketing industry worldwide and is often hired to train internal teams, agency and universities on SEO, Content Marketing and Social. Carrie Hill is the co-founder of Ignital Digital agency that provides local search marketing solutions for small and medium businesses. She is a regular columnist for multiple publications, including industry authority sites Search Engine Land and Search Engine Watch. Jennifer Slegg is a longtime speaker and expert in search engine marketing, working in the industry for almost 20 years. When she isn’t sitting at her desk writing and working, she can be found grabbing a latte at her local Starbucks or planning her next trip to Disneyland. She regularly speaks at Pubcon, SMX, State of Search, Brighton SEO and more, and has been presenting at conferences for over a decade. Hobby: More than a hobby….I have a comedy background and it informs my work. Standup and improv. I perform and teach…both using applied improv in marketing and content and I teach improv on weekends. As a child I wanted to be: Comedian, magician, an animal. So I guess I am all three. Describe your job in 3 words: Helps teams create! I’m currently working on: Speaking, my next book and a play. I’m currently working on: My main focus is on my Podcast – Social Media Marketing Made Simple. I love that every week I can share marketing tips tools and strategies. I’m currently working on: Currently working on a new campaign for DeepCrawl where we go back to our roots and tell our brand story. Its been an interesting experience digging more into the roots of the brand and discover the why and the how that got us to where we are today. Hobby: Creating any kind of content, my second passion is dance and tractors (I run a blog about agro machines). Favorite food: Anything that came from Asia. I’m currently working on: I work on the newest edition of the Top 100 Digital Marketers report on Brand24. That’s the 3rd year and edition of this white paper I prepare for Brand24 with the team. Solid piece of data-driven white paper that each year has a big influence on brand awareness. Beyond this, I have 3 really important events on my agenda. I host and organize one, and I’m a speaker at two other. Those are huge conferences with an excellent list of speakers and 700+ attendees so I work hard on the best speech I can deliver. Additionally, MaxTractor.agency which I launched last year is growing consistently, which fills me with huge satisfaction. Describe your job in 3 words: Inspiring. Engaging. Exciting. Stop Moaning, Start Owning is the follow up to Unleash Your Awesome, for US-based Motivational Press. More Whispers From The Earth is the follow up to (as you might guess) Whispers From The Earth, for Moon Books. I’m also preparing for my second TEDx, as well as getting ready to run a global personal branding masterclass with former Discovery Channel presenter and Oprah guest, Dr Andrea Pennington; it will be in Cannes in October. I’m also launching an online mastermind group – ‘This Is Me’ – for professionals who are ready to go for the next level in branding and public speaking and design their own signature speech. We’ll be working on presentation, message, audience, body language, delivery, and even helping delegates to create their own ‘An Audience With…’ event to generate those oh-so-important video and image assets, as well as gain testimonials and experience of presenting, note free, in front of a live audience. What else? I have 13-month and three-year spiritual empowerment and personal development programmes starting in September, as well as a new podcast AND I’ve just been signed to a second speaker agency in Singapore. I’m currently working on: My presentation for the Digital Forum in Moscow where I’ll be delivering to 35,000 people. Also working on my editorial calendar for my own blog… which always take a back seat! Conferences I spoke at: SearchLove London 2018, Email Innovations Summit 2018, Digital Forum Romania 2019, Emailing 2020, International IT Forum Ukraine, Digital Olympus 2018, Ungagged London 2017 & 2018, Judge for the DMA Awards 2017 & 2018, E-Shop Email Summit 2018, Conversion Conference Berlin 2018 and many more! Blogs I contributed to: Smart Insights, DMA UK, Only Influencers, Let’sTalk Strategy blog, Email Monks, Mailkit, Econsultancy, Email vendor selection, Digital Doughnut and many more. I’m currently working on: Currently my agency is providing strategic consultancy for a variety of organizations to overcome a number of marketing challenges. I’m also preparing my presentation for SMX Munich, providing bespoke workshops, blog, and course content. Conferences I spoke at: Marketing Business Summit Milan, BeachBody UK Success System Live, The Business Show (London), Royal Bank Of Scotland, Now What Live?, IGNITE Business, Transform Your Business, Sicilia Convention Bureau, The Giftware Association and many more. Blogs I contributed to: Predominantly on Medium.com, where I contribute to some of the marketing publications. I’m also a regular columnist for America Out Loud where, though predominantly lifestyle and public opinion, I do include marketing and personal branding topics. Hobby: Between coaching, speaking, training and writing my books there’s not much time! I do love to travel to new place with my wife and I work out regularly. Personal development is a passion of mine – I usually have an audio book on if I’m driving between appointments. I’m quite a spiritual lass too, having spent a decade or so learning from shamans and medicine people – some of these really deep teachings sometimes come through in my work. Favorite food: I went vegan a couple of years ago, so I’m still getting used to not saying a nice, succulent fillet steak! Now? I do love a good Nepalese feast. As a child I wanted to be: Happy and free! I’m currently working on: I have two books underway for two different publishers: Stop Moaning, Start Owning is the follow up to Unleash Your Awesome, for US-based Motivational Press, and More Whispers From The Earth is the follow up to (as you might guess) Whispers From The Earth, for Moon Books. I’m also preparing for my second TEDx, as well as getting ready to run a global personal branding masterclass with former Discovery Channel presenter and Oprah guest, Dr Andrea Pennington; it will be in Cannes in October. I’m also launching an online mastermind group – ‘This Is Me’ – for professionals who are ready to go for the next level in branding and public speaking and design their own signature speech; we’ll be working on presentation, message, audience, body language, delivery, and even helping delegates to create their own ‘An Audience With…’ event to generate those oh-so-important video and image assets, as well as gain testimonials and experience of presenting, note free, in front of a live audience. What else? I have 13-month and three year spiritual empowerment and personal development programmes starting in September, as well as a new podcast AND I’ve just been signed to a second speaker agency in Singapore. As a child I wanted to be: crane operator – I know, strange but it’s true. Describe your job in 3 words: Making better websites! I’m currently working on: Currently, my focus is on creating a totally new approach to website optimization that aims at not only making websites search-engine friendly but also super-fast and efficient in term of development and maintenance. Marie Haynes, Owner of Marie Haynes Consulting Inc.
Hobby: Fantasy football and playing Fortnite! As a child I wanted to be: Either a magician or a mommy. Accomplished both. I’m currently working on: We’re super excited to hear confirmation from Google that there is use for the disavow tool outside of manual actions. We’re now offering link audits again and are working on a program to work with SEO agencies in a white label capacity doing link audits. Conferences I spoke at: BrightonSEO, MKGO, outREACH, PintSized Marketing and Digital Olympus. In 2019 I’m speaking at SearchLeeds, MozCon and Learn Inbound. Hobby: Food, gym & travelling! Favorite food: Cheese, cheese and more cheese. As a child I wanted to be: I wanted to be a lawyer until I took a-level law and hated it. Describe your job in 3 words: Rewarding, creative & fast-paced. I’m currently working on: My work at the moment broadly covers a number of things, from making Aira great at all things digital PR and content focused through to delivering high quality creative campaigns for our clients. On a personal development note, I’m working on lots of speaker pitches in preparation for conferences this year – I want to share my knowledge with others whilst learning and growing as a digital PR professional. I’m also routing for all of the amazing women (and men) in our industry! May we continue to support each other, rather than bring each other down. Conferences I spoke at: PRmoment, INBOUND, Learn Inbound, UnGagged, Yoastcon, SMX München, BrightonSEO and lots more! Hobby: Travelling – completing 30 countries under 30! I’m currently working on: Our reporting and measurement framework to accurately measure the true value of Digital PR not the usual fluffy metrics. Hobby: I love to travel; ideally involving good wine and food too. Favorite food: Too many to choose from! I’m currently working on: A whole range of things really! I’m loving that my role involves so many different aspects right now. We’re currently working on some really exciting voice search projects and creating optimisation frameworks for those which I’m finding so interesting. I’ve also got a lot of conferences coming up in the next couple of months to be preparing for so am busy thinking about all things in the future of search. I’m currently working on: Currently working on the launch of the new Biddable Moments website and moving into our new office! I am organizing an alternative education experience for young kids that integrates traveling, entrepreneurship, digital storytelling, and experiential learning. As a child I wanted to be: When I was around 4y, I told my mom that “I want to become a mom.” For the cuteness of which I am very proud of my little self. Later on, I wanted to become a teacher. I looked towards marketing only when in university in my 20s. I’m currently working on: I am currently leading the global marketing team at Taxify. We’re already in 30 markets and the team has grown from 10 to 40 in the past 1 year. So you can imagine the pace and challenges we’re daily dealing with. But it’s also highly rewarding to be contributing to something big that impacts tens of millions of people’s everyday lives. As the team lead, my tasks range from hiring to campaign planning to writing copy for website when needed. Another thing I like about my job and team is that nobody’s a princess saying “this is not my job.” When we need to get something done, we get it done – whoever has the knowledge and time at a given moment. Describe your job in 3 words: Links with content. I’m currently working on: As of today, I’m helping the NeoMam team at different stages while they produce 25 pieces of content, promote 10 campaigns and generate ideas for 5 upcoming projects. Last week I set my 90-day goals for the next quarter so I’ve just gotten started with the development of a new reporting tool and a big overhaul of our promotion process to ensure there is no redundant task or unnecessary admin that is wasting the team’s time. I’m currently working on: Developing and expanding Actionable Marketing Guide and related products. Conferences I spoke at: SearchLove, MozCon, eMetrics, Webbdagarna, Google I/O, Google Analytics Partner Summit, [email protected], OMR, Superweek, ConversionXL Live, CTAConf, and many more. Over 100 conference speaking appearances. I’m currently working on: I’m currently working on building out a world class product marketing and growth org at Quantcast, a company on the bleeding edge of AdTech, driving clear value to our customers through advanced modeling and smart targeting capabilities. Also, I’m hiring! If you’re looking to join a growing and exciting Product Marketing or Growth team, reach out! My work encompasses more social-specific strategies all the time, which is so exciting! I continue to collaborate with my other long-funnel B2B and SaaS marketing heroes here at Hanapin. Long customer journeys are just so fascinating to explore and satisfying to refine. For one of my clients, we’re specifically working on adding an e-commerce checkout to their content strategy, where historically leads came in and final transactions were booked via phone call. I consult on how to effectively map out a content matrix both for SEO and for optimal nurturing of leads to final conversion transactions. My approach is customer-centric and involves detailed discovery and user testing along with a hybrid of emotional targeting psychology and data analytics to drive/inform strategy. I’m currently working on: We are building The Home Depot’s retail advertising business, allowing our brands great opportunity to reach the best in-market home improvement shoppers. I’m currently working on: Launching the most advanced workflow automation and project management software with artificial intelligence, full customization, to improve productivity. Conferences I spoke at: Too many to list! Hobby: Playing with my dog! Describe your job in 3 words: Figure out Google. I’m currently working on: We are working hard to market our awesome Mobile SERP test and other tools that let you see what actual search results look like on actual phones from specific addresses, anywhere in the world. It is great because you can test one keyword from many locations all at once with a CSV upload or test multiple points in a service area. We also have a mobile page test tool and a fantastic ASO tool. We also have been doing a lot of writing about Mobile-First Indexing, languages, international search and #Fraggles. I’m currently working on: I’m currently leading marketing at Crayon, a software-driven market and competitive intelligence company based in Boston. You can find me blogging and speaking about anything from competitive intelligence strategies to sales and marketing alignment to marketing analytics. Conferences I spoke at: MozCon, Inbound, Content Marketing Conference, Digital Summit Series, Content Marketing World and many others. Blogs I contributed to: A lot… some in the past have included TNW, Entrepreneur, Forbes, Marketing Profs, Crazy Egg, etc. Hobby: Searching new cities for underground speakeasy bars. Favorite food: All of it- but lately eastern asian cuisine (korean specifically) is what I’m craving. I’m currently working on: Building out a long-term strategy for dominance in visual communication- but also building a really cool presentation tool and making a better user experience on Venngage! Hobby: Cosplay, coffee and anything Disney or Harry Potter-related! Favorite food: Steak and french fries. I’m currently working on: I’m currently working on promoting women and people of color in both my LinkedIn video channel as well as my Forbes column. There are so many beautiful entrepreneurial stories to share! Favorite food: like, all of it. But DONUTS! I’m currently working on: I am always looking for a good problem to solve. As my agency has gone through a number of mergers recently, my focus is heavily on how to integrate and maximize very smart search and content professionals. I am also digging into the globalization of our discoverability practice to help it scale internationally. Conferences I spoke at: I do online summits. As a child I wanted to be: A Scientist. I’m currently working on: Helping high-growth companies optimize their websites and funnels and create experiences people LOVE to convert to. Blogs I contributed to: Litmus, Help Scout, quoted in many others. I’m currently working on: Help Scout is working to empower customer-centric businesses with tools that serve people in the most human, helpful way. For example, Beacon (Help Scout’s live chat product) sets the right expectation with visitors by only showing a chat option when someone is available to help. It also allows you to customize the visitor experience with options (called “Modes”) to prioritize a self-service approach (and thereby deflecting the need for live support), a live chat approach (for teams that want to emphasize customer chat), and a neutral mode that offers both options side-by-side. Conferences I spoke at: CTA Conf, Interact, Pulse, SearchLove, CXL Live, Digital Elite Camp, Learn Inbound (coming up), probably others that I’m forgetting! As a child I wanted to be: Famous. I’m currently working on: At CXL Institute, we’re building programs and courses in digital marketing, optimization and analytics for anyone interested in upskilling themselves or their teams. All courses are taught only by the top 1% practitioners who teach you their tips and strategies so you can learn from the best (and become one of them). Conferences I spoke at: SMX East, SMX Munich, Moz Local, NgAtl, etc. I’m currently working on: Finding creative ways to get our users to register with us across our 80+ websites, given the fact that we’ve removed the main registration interactions from most of the pages (due to organic traffic challenges). Also finding creative ways of getting ‘second clicks’ from our audience, working in personalization, content marketing and UX tests. I’m currently working on: Working on a study around how once your website hits a certain level or mobile traffic the form pages convert better for phone calls. Hobby: Relaxing with my husband and friends, eating good food. Favorite food: Couldn’t possibly choose just one thing. As a child I wanted to be: A lawyer. On TV it looked like all they did was talk. And I was pretty good at talking so I thought: I could do that! Describe your job in 3 words: Fulfilling. Challenging. Fun. I’m currently working on: I’m working on my new talk for this year: The Lost Art of Asking Questions. I’m currently working on: Right now I’m working growing my network in Portland. I’m currently working on: I am analyzing 100 websites to see how E-A-T played into effects of algorithm updates. Also analyzing how Google users feel about recent updates by Google. I’m currently working on: Learning math (calc 2 and discrete math), programming skills, becoming a better public speaker and storyteller, just started recording an eCommerce SEO podcast (for launch in April), I also really want to start a web comic (but am still a bit tentative). Describe your job in 3 words: Creative, innovative, rewarding. I’m currently working on: An updated version of my ebook: The Small Business Guide to Facebook Ads. Favorite food: Chocolate… Wine… Errrrr…. I’m currently working on: I am currently deep in a few consultancy projects helping a few B2B and a B2C company change their digital marketing and get it working more efficiently, eventually leading to me leaving them with a plan going forwards. I’m also working with a team of amazing SEOs to update the Econsultancy best practice guide to SEO, I teach courses on advances SEO, PPC and one on social media marketing (plus I do bespoke ones) and generally running around speaking at conferences and judging chocolate. I’m also doing a weekly podcast and webcast with David Bain for SEMRush called Marketing Scoop! I’m currently working on: I have been doing speaking engagements and training with Digital Marketing Institute and Grand Canyon University, and in 2019 I’d like to do more content strategy and writing projects. I’m currently working on: I am the organizer of Search London, a meetup group in Central London. We just celebrated our 8th birthday in February. I am the Marketing Manager at OnTheGoSystems, the company behind the WordPress plugins, WPML and Toolset. I am also an advisor for Digital Elite, the best SEO and CRO conference, taking place June 6, 2019. Hobby: Cars, writing, creating content, coffee (definitely counts), listening to true crime, reading, learning about the “unseen” world around us, film. Favorite food: Tough question. It depends on my mood, but I really can’t go wrong with spicy as hell guacamole. Describe your job in 3 words: Gratifying, challenging, ever-changing. I’m currently working on: A bunch of things. My podcast, PermissionLESS, can be found on iTunes, Stitcher, Spotify and PermissionLESS.com. Blogs I contributed to: Mainly contributions to expert roundups (e.g. on ContentKing, Rank Ranger, Searchmetrics blog) and Ryte Magazine. Hobby: My main hobby is SEO, of course! But aside from that, my interests lie in gaming, film, beer, attending meet-ups and writing. As a child I wanted to be: A marine biologist, despite being a terrible swimmer. Describe your job in 3 words: Being on fire. I’m currently working on: Right now I’m having a blast working on my digital marketing podcast “The Izzi & Nils Show” with my best mate and CRO expert Nils Kattau. I’m also preparing a number of slide decks for really awesome upcoming conferences this year (such as SMX Advanced, Digital Elite Day, BrightonSEO and more) on topics such as UX-driven SEO, large scale local SEO and SERP optimization. When I get the chance, I also really want to start building up my personal website with educational and, hopefully, entertaining content on all things Search. As a child I wanted to be: A Nun. Really. I’m currently working on: I’m focussed on client work predominantly, delivering organic revenue growth for largely consumer brands. Preparing talks for Digital Olympus, Freelance Heroes Day and Digital Elite Day. I’m currently working on: Developing a framework to have open discussions about mental health awareness at conferences as part of educating fellow marketers and opening lines of communication to help each other. Conferences I spoke at: Inbound, Pubcon, BrightonSEO, Mozcon, SearchLove and many more! I’m currently working on: Besides doing SEO consultancy I’m also Remoters.net – a remote work hub, with remote jobs listings, guides, interviews, tools, events and more! Hobby: Photography, Singing, Dance, Irish Pubs. I’m currently working on: Currently, just finished a long term full time/onsite project with a top 20 retailer. Now moving back into site auditing and site recovery planning. I stand between people getting hired or fired. If I do it well, the company will hire more people and if I don’t people will lose their jobs. I take that very seriously and so I really like the feeling of turning companies around by fixing their organic and conversion issues. I’ve taken companies from red to black simply by implementing proper SEO and Digital Marketing Strategies, so that is where I like to live these days. Describe your job in 3 words: Creative. Content. Communication. I’m currently working on: Focusing the service we offer at ShellShock to content strategy and evergreen content production with a subscription for content reviews and updates. Describe your job in 3 words: Expansion. Joy. Flow. I’m currently working on: Building customized SEO strategies for international brands. Working on my “conscious SEO for content creators” teaching materials. I’m currently working on: Ramping up marketing for SEMPO @sempoglobal professional organization. Hobby: Traveling as often as possible! As a child I wanted to be: A force of nature. I’m currently working on: I help brands, agencies and other organizations design and execute content strategy and systems that work. I also offer digital marketing consulting and troubleshooting on an hourly basis via video chat, teach digital marketing classes locally, and am designing an SEO course for content creators that will be available online this summer. Conferences I spoke at: I teach 4-hour SEO Workshops at the Digital Summit Series. 2018 I taught in Kansas City, Chicago and Detroit. Conferences I spoke at: SMX East, SMX West, SMX Advanced, SMX Munich, HeroConf, Utah DMC, PDX Engage, State of Search. In addition to those, I will also be speaking at Digital Growth Unleashed, Brighton, and SMX Advanced Europe this year. Hobby: I love to travel and I love being outdoors. Favorite food: Probably sushi or shrimp but that’s a tough call. I love food. As a child I wanted to be: As a child, I wanted to be a fashion designer which is laughable because I pretty much live in jeans and tee shirts. I’m currently working on: My focus in 2019 is on growing and scaling my agency as well as our brand awareness. Describe your job in 3 words: Never ever boring. I’m currently working on: Revamping my SEMrush webinars. I’m currently working on: My top areas of focus for 2019 are knowledge and sharing. As I continue to gain a deeper understanding of the mechanics behind many of the technical aspects of SEO, through research and trial, I’m also looking for ways to continue to contribute to the already extensive knowledge base that exists within the SEO industry. I’m currently working on: Shopping Actions with Google, all things eCommerce and what does it all mean?! I’m currently working on: I’m working on my dissertation to complete my PhD program. I’m so close! I’m currently working on: I always work to market Pubcon and to help readers find helpful information at SEMrush. Conferences I spoke at: AdWeek New York, Live Ramp 2019 Ramp Up, Marketing MasterMind, SMX (West, East), Mumbrella 360, PubCon, SEOktoberfest, DMEXCO, Friends of Search, MN Search, Digital Summit, Internet Summit Raleigh, Search Insider Summit, Retail Global, Digital Dealer, Trillium Auto Dealers Association, Yext Onward, etc. Favorite food: Cheese. I’m from Wisconsin! I’m currently working on: I recently launched a sustainable sock company with my husband called swaggr. We make socks almost entirely from recycled plastic bottles. It’s been a ton of fun being on the “other side” of a passion project. We had a successful Indiegogo campaign and we’re live for e-commerce in March! Describe your job in 3 words: Ready, set, go. I’m currently working on: My deck for SMX Munich! I’ll be sharing on the technical foundations of successful internationalization. SMX be my seventh talk (fourth international) since I put my hat in the speaking ring last year. I’m currently working on: Currently working on growing my agency to offer more in-depth consulting and auditing services for social media marketing and content marketing for medium to large-sized businesses. I’m currently working on: Project Eli – aka my newborn boy. But when I get back, working on technical SEOing our WordPress news site with Gutenburg in mind. Favorite food: Just about everything but olives and anything made with soy sauce. As a child I wanted to be: I’m still trying to figure it out. Describe your job in 3 words: ever-changing. I’m currently working on: I am in the process of launching a new directory, stay tuned. Favorite food: I love to cook – but I can’t choose between healthy and unhealthy. A good balance of both! As a child I wanted to be: The President. Now I’m sure I don’t. As a child I wanted to be: Professional basketball player. Too bad I never got any taller…or better at basketball. I’m currently working on: Right this moment, executing our strategy for a new SaaS client. Working through a large account restructure/expansion, while ensuring all conversion tracking and tagging are set up for long term success with both interface and CRM data points. Always love seeing all the pieces come together and have a huge impact on lead quantity and quality. Hobby: Wating Rugby – really sports of any kind, Shoe shopping, wine tasting, Opera and Ballet! Conferences I spoke at: This year marks my first foray into industry speaking events! I’m slated to speak at WordCamp Santa Clarita and SearchLove Boston. Other speaking/teaching (but not conferences) = several Moz WBF videos and slated for one of Siege Media’s Content & Conversation segments. Hobby: Baking, being outdoors, and any activity that involves spending time with my husband Chris and our black lab Bagel. Favorite food: I’m a sucker for pastries. I’m currently working on: I’m currently pouring my heart, soul, and most of my waking thoughts into Soapboxly. I’m all-in on making this the greatest content-focused marketing agency it possibly can be, and I can’t wait to see how we’re able to help our clients grow their businesses. Describe your job in 3 words: Fun. Fortunate. Fabulous. I’m currently working on: After Acquisio’s 2017 acquisition I’m currently transitioning to a role as Content Director at Web.com. This will mean elevating the Web.com brand through content marketing techniques and initiatives that speak to SMBs. I’m stoked to ramp up organic traffic, external content collaborations and even develop an SEO-friendly strategy for YouTube! There is much to do and the marketing possibilities are broad, so it’s going to be an exciting year to come. Right now I’m doing the final QA on the new Acquisio website (check it out!). Conferences I spoke at: Digital Growth Summit (Los Angeles); SocialPro (Seattle); Social Media Week (Los Angeles). Blogs I contributed to: Search Engine Journal (Outside of digital marketing blogs, I also write for Brides, Allure, Glamour, Vogue, Teen Vogue and Epicurious). Hobby: Dancing, fitness and home decorating. Describe your job in 3 words: Challenging, rewarding and limitless. Hobby: Playing the harp, baking Paleo recipes and meals! As a child I wanted to be: Someone who ‘helps’ people, a leader, a creator. I thought that was a ‘nurse’ when I was little, but it turned out to be an agency CEO and content marketer instead! I’m currently working on: I’m launching a new brand in April, 2019! I can’t say much about it, but it will be my third business (my first two are Express Writers & The Content Strategy & Marketing Course). I’m SO excited to reveal my new brand to the public soon! I’m currently working on: My work revolves around empowering advertisers and agencies alike to get the most out of their accounts. Sometimes that means a deep dive into their accounts, but in many cases it’s a process conversation – helping them see new paths to profit and how to prioritize. I take the intelligence from these conversations back to the customer success, product, and marketing teams at WordStream so we can evolve our offerings to better suit the needs of our customers. I’m also able to pull data across the entire book to inform studies for speaking engagements (quality score, close variants, automation, etc.). I’ve also been volunteering at local universities to teach students “real world” marketing skills. Conferences I spoke at: INBOUND, The Next Web Conference, AdWeek, MozCon, SearchLove, Pubcon, SMX, BrightonSEO, State of Search, Digital Summit etc. Hobby: Travel. I love it! As a child I wanted to be: a vet and take care of all the homeless dogs in the world. I’m currently working on: A research piece into how we can better optimize the Customer Experience across our marketing channels, and with the help of AI. I’m currently working on: I’m about to launch a new company. It’s a development & SEO Agency specifically for Bloggers. I’ve had the opportunity this past year to work with a lot of successful Food bloggers and helping them increase their rankings, page views and ad revenue has been such an amazing experience. I’m looking forward to utilizing my knowledge & skills that I’ve used for over a decade with local business clients and apply them to an incredible niche!